Tom Wrought is being framed. Life hadn't been easy up to this point, but he never expected it to get this bad. A Pulitzer prize and colloquial respect as a historian did little to protect Tom from the hysteria of McCarthy's crusade against communism. Black-listed and humiliated, Tom relocated to Oxford where he found the love of his life Liz. The only problem. . . Liz is married. As the affair of Tom and Liz progresses, the two become soulmates. But the bliss of love is soon interrupted by the sudden murder of Liz's husband. The poor man is pushed in front of a train on the London Underground, and Tom is the prime suspect. The authorities see the event as a cut and dry case of "the other man" killing the husband out of jealousy. Despite the clear motive, Tom adamantly proclaims his innocence. Lucky for Tom, Liz believes him. She hires a young lawyer to defend him and to get to the bottom of who would frame him. As the story unfolds, we learn secrets of Toms past that have the potential to unearth an even larger conspiracy of global proportions. In Autumn in Oxford, author Alex Rosenberg crafts a deliberately plotted thriller that is riveting from start to finish. I was reminded of the works of Joseph Kanon, especially The Good German, as I read this historical novel that was full of twists and turns that come with Cold War espionage. The characters are intricately drawn and help to keep the pages turning even when the action stalls. It was particularly refreshing to have two women, Liz and her solicitor, take the reigns of the investigation, especially given the time period of the story. 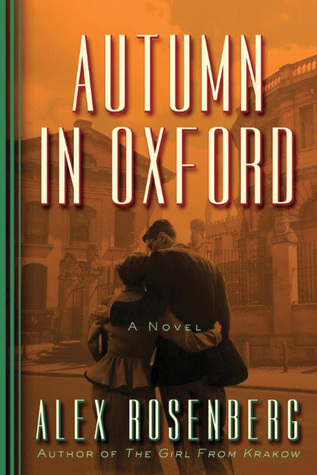 Autumn in Oxford is a novel that could have benefited from one final editing pass, but ultimately the heart of the characters and intrigue of the plot elevate the book into a fascinating and engaging read. For more information, visit Amazon, Goodreads, and TLC Book Tours. This entry was posted on Tuesday, September 13, 2016 and is filed under Alex Rosenberg,Autumn in Oxford,Book Review,Giveaway,History,Lake Union,Thriller,TLC Book Tours. You can follow any responses to this entry through the RSS 2.0. You can leave a response. I liked Gore Vidal's Burr an awful lot, plus was caught up in Frazier's Cold Mountain.